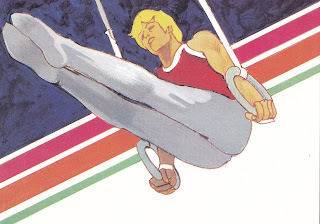 This original artwork by Robert Peak was used for the design of the men's gymnastics stamp from the 40¢ international airmail block of four honoring the 1984 Summer Olympics. This stamp was issued at Los Angeles, California 33 years ago on April 8, 1983. Update: the card was later sent to Belarus as US-3975285.